Exelon has completely stopped work towards a new nuclear power plant in Victoria County, Texas, having gradually reduced its ambitions for the site over recent years. Representing a new large reactor at an entirely new plant site, Exelon's Victoria project was one of the more exciting US new build proposals in 2008 when the company applied for a combined construction and operating licence (COL) from the Nuclear Regulatory Commission (NRC). Two years later, however, and the plummeting price of gas in the US had caused Exelon to reduce the scope of its application to an Early Site Permit (ESP) only. Achieving an ESP means securing NRC approval for Victoria as a site generically suitable for a large nuclear power unit. Valid for 20 years, the ESP would have given Exelon a window of opportunity to supplement it with plans for a reactor already certified by the NRC as the basis for a COL that would lead to a new power plant. Now, Exelon has withdrawn its ESP application, bringing "an end to all project activity." The company said, "The action is in response to low natural gas prices and economic and market conditions that have made construction of new merchant nuclear power plants in competitive markets uneconomical now and for the foreseeable future." In 2007, when Exelon was pursuing nuclear build at Victoria, the wholesale price of gas was at a high of about $10 per million Btu. 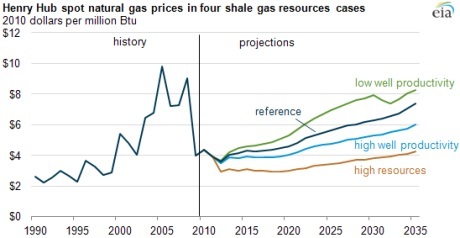 Now the Energy Information Administration predicts prices below $8 per million Btu until 2035, despite its "considerable uncertainty regarding the size of the economically recoverable shale gas reserves." Accordingly, many nuclear projects from the mid-2000s push are moving slowly through licensing. Some will be realised: pairs of AP1000 units are well under way at Vogtle and Summer, while a unit is being completed at Watts Bar - all of these on a non-merchant utility basis. Exelon recently merged with Constellation Energy and now boasts generating capacity of some 35,000 MWe. Some 19,000 MWe of this comes from 22 nuclear reactors, making Exelon's one of the lowest carbon generation fleets in the world.